An earlier article said US-led overnight Friday aggression on Syrian targets wasn’t the end of it. It was likely prelude for further aggression to come, maybe all-out war ahead, risking confrontation between Russia and Washington. Syria is a hugely dangerous flashpoint. With Israel itching for escalated aggression, along with lunatic fringe Bolton and Pompeo hardening Trump’s war cabinet, anything ahead is possible. Overnight Monday, Syria’s military reportedly intercepted six air-to-surface missiles targeting its Shayrat airbase, another three launched at its Dumair base. The Pentagon denied involvement. Israel almost never comments on these type attacks. The IDF was likely responsible for the overnight incident – attacking Syrian targets often from Lebanese airspace. Russian military personnel are reportedly at Dumair. Syria’s military initially said unidentified warplanes launched the attack, later blaming Israel for the incident – either from Lebanese airspace or at high altitude overflying Syria. No damage or casualties were reported, all missiles apparently intercepted or failing to hit intended targets. The incident is the second in the last 72 hours, more like it almost certain to come. Following US-led overnight Friday aggression on Syria, Sergey Lavrov said it won’t go unanswered. “Several years ago, we decided not to supply S-300 systems to Syria at (the) request (of these countries). Now we will consider options to ensure the Syrian state’s security after this outrageous act of aggression from the United States, France and Great Britain. Russia should expedite delivery of these air defense systems to Syria, what should have been done years ago, vital to do now as quickly as possible, an important deterrent to US, UK, French and Israeli aggression. These systems should target their warplanes along with further missiles fired at Syrian targets – making them pay a price for naked aggression. Lavrov said Russia is ready to aid Syria curb further incidents. Shipping S-300s to its military should be expedited. Two acts of aggression on Syria’s military surely indicates much more to come, Russian personnel on the ground endangered. Self-defense is a universal right. 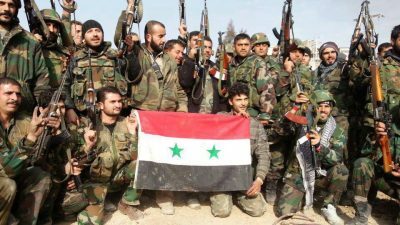 Damascus needs help in defending its sovereign territory from aerial, land and offshore attacks. Lavrov explained the logic of Theresa May’s “highly likely” Syrian use of CWs accusation. It’s “highly likely” and then some that further aggression is coming. Will Russia continue acting passively, relying on diplomacy having achieved nothing, or will it challenge Washington, Israel and their imperial allies more forcefully? Much rides on what Putin decides to do.